Remember yesterday when I told you about the happiness I felt when I stopped to observe that chorus of cheery monkey-faced pansies shimmying in the wind? Well, it appears that I'm not the only one who derives pleasure in those colorful treasures. Check out what www.herbs2000.com has to say about my pal the pansy. A pansy derives its name from the French word pensée which literally translated into English denotes ‘thought’. The herb was so popular in Europe that even Shakespeare mentions about it when Ophelia refers to pansies as ‘That’s for thoughts’. Interestingly, in the conventional ‘flower language’, the three colors of the pansy flowers stand for three different things. For instance, purple, while and yellow stand for memories, loving thoughts and souvenirs respectively. And what is noteworthy is the fact that all the three terms bring a sense of comfort and ease to the heavy hearts of separated lovers. Hence, pansy is also often known as the ‘heartsease’. That's right. Me and my old buddy Shakespeare...we know a good thing when we see one. Enough of the history lesson. Let's make a Simple Saturday Fingertip Puppet! I know you can't wait. I can see you sitting there right now with your construction paper, tape, scissors, and waterproof markers in hand. Let's get after it! 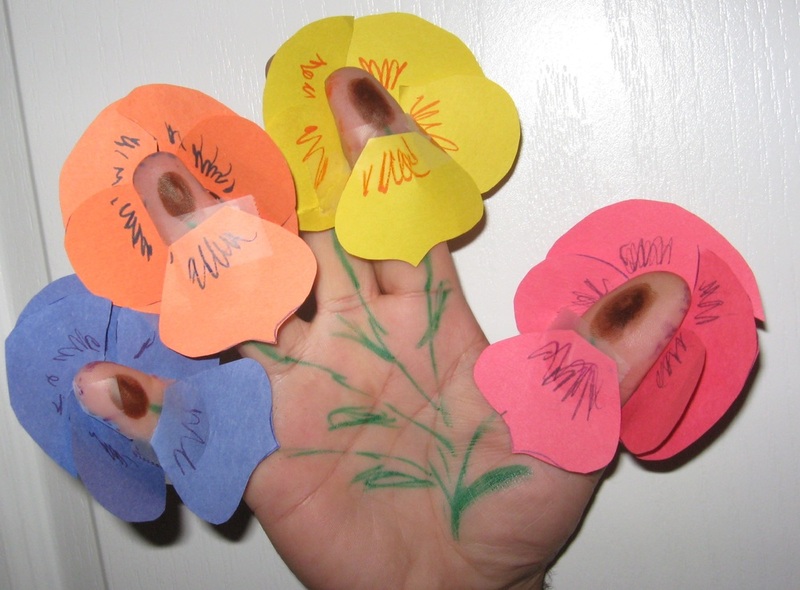 To begin with, let's use the markers to draw the pansy's center and its stem along the inside of one of your fingers. I used my pinkie finger. You can chose which ever one you'd like to. Heck, use all 10 of those digits, if you'd like! Next, draw 5 petals on the construction paper and cut those heartshaped darlings out. Next is the tricky part. Tape the petals around your fingertip. After a tiny bit of pansy petal shading...ta da! You have made a Simple Saturday Pansy Power Fingertip Puppet! Isn't that the cutest thing you've ever seen? Hey...you know what? I think I'm going to replicate the pansy chorus and make a pansy puppet on each of my fingertips. Yeah...that's it. All right, y'all... I'm offically inspired. For now, my friend, for the sake of time we'll have to settle for this solitary bloom. BUT keep your eye on this post. Get set for an update... a plethora of pansies! Newer PostSimple Saturday Prep: Spiro-mania!